A playground is scheduled to be added to the new South Bossier Park, which officially opened earlier this spring. Funding for the playground is $75,000 remaining from an allocation Bossier City had made when Bossier Parish and Bossier City decided to share the cost of creating the park. In December 2012, businessman Buddy Lucky donated 20 acres of land and agreed to sell additional acreage. A land swap brought the total size up to 108 acres, of which about 96 acres is useable. 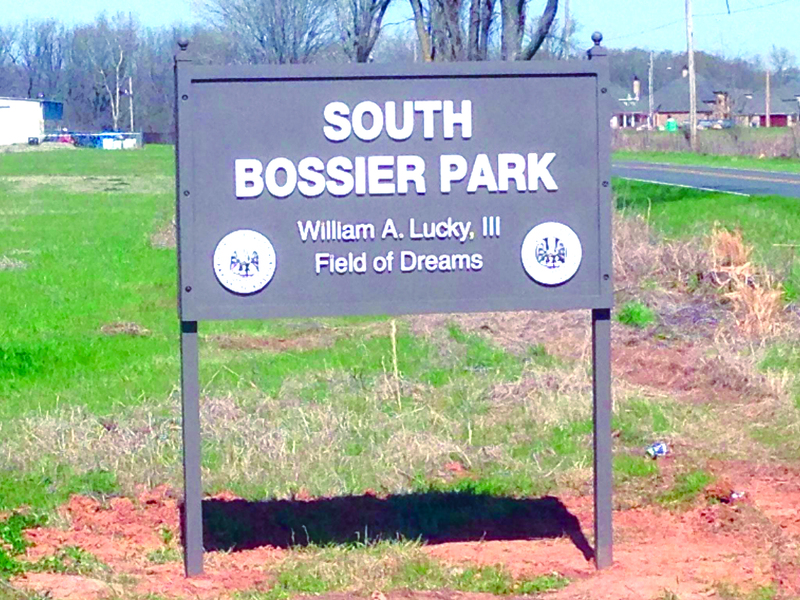 Bossier City, which had been contemplating a city park off Sunflower Road in southern Bossier City, opted to join forces with Bossier Parish to build South Bossier Park, which is located about five minutes from Parkway High School and is a short distance from the city limits. Bossier City provided $950,000 to build the park, with Bossier Parish paying for the engineering and helping with park roads, walking trails and parking. Parish Engineer Butch Ford said the original master plan for the park included a playground. He told the Bossier Parish Police Jury the playground has already been designed and they approved going ahead and getting bids or quotes for the project. Included in the design is a tent to provide sun protection particularly during hot weather. Located on 108 acres off Caplis Sligo Road, the complex opened with 15 softball or baseball practice fields and four fields that can be used for lacrosse, football or soccer. There is currently no fencing around the fields nor is there lighting. What that means is that the softball/baseball fields at least for the time being will serve as practice fields rather than competition fields. Ford said that with just $75,000 available at present for park, providing a playground for youngsters ages 3-5 will provide the most bang for the available bucks, and it essentially completes Phase One of the park. As funding becomes available, officials hope to keep making improvements to the park over time. The park is already equipped with restrooms and water fountains. Ford said a contingent of missionaries from Burma, who are currently in seven states, and includes some currently at First Baptist Church of Bossier City, plan to have a soccer tournament May 24 at the park. Lack of sufficient practice and competition fields for soccer was a concern and part of the reason the park was created. Aside from the sports fields, the park also provides about 40 acres of opportunities for walking and general recreation. About one-third of the park tract is undeveloped, with plans calling for additional sports fields and parking.